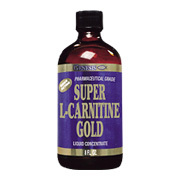 Super L-Carnitine Pharmaceutical Grade Genesis Nutrition's Super L-Carnitine Gold is a revolutionary, mega potency L-Carnitine supplement specially prepared in a liquid state for quick and enhanced absorption. Perfect for gaining muscle during a weight lifting program. L-Carnitine's primary function in the body is the transportation of fats into the muscle cells where they are converted into energy. Recent research also indicates L-Carnitine may be beneficial to the heart, the liver and the kidneys. As a dietary supplement, take one to three tablespoons daily, especially before working out. Super Liquid L Carnitine is shipped in a discrete, unmarked package. Orders are processed immediately and usually take about 3 to 5 working days to be received. We do ask that you try it for 2 to 3 weeks to feel the full effects. Any information received is used only for order processing and shipping purposes. Your information, such as e-mail address, will never be disclosed to a third party.